Good luck to the following girls who are representing Rustenburg at the Champions’ Cup Tournament this coming weekend. We wish you success and enjoyment over this busy weekend, 12-14 April. 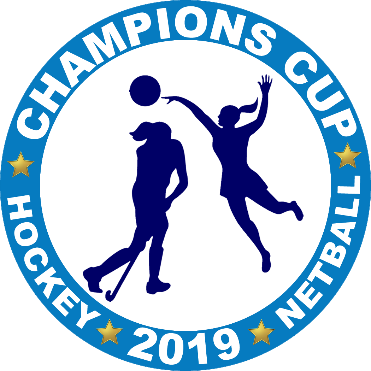 More information is available on the official Champions’ Cup website. Sophie Macdonald, Jules Sweetlove, Aaliyah Khan, Robyn Biccard, Scarlett Lethbridge, Amy Forbes, Alexa Ceruti, Amber de Villiers, Lisa Penney, Jodie Blows, Annie Malherbe, Saarah Magiet, Alhaan Emeron, Kamea Chetty, Ashleigh Rix, Emma Naiker. Charlotte de Beger, Tyler Barnes, Dominique Taylor, Charity Strauss, Result Machiya, Chloe Williams, Luyanda Ndaba, Katherine Worthington-Smith, Luleila Oosthuyzen, Anna Gray. Good luck to all our Netball, Hockey and Touch Rugby players who are attending Provincial trials over the next few weeks. Alida van der Merwe (Gr 12) was selected to represent the Western Province Women’s Cricket team at the CSA National week in Bloemfontein, from 25-29 March. They played 50 over matches against Free State, Boland and Border. Her team made it to the semi-final where they won against Northerns and then unfortunately lost to North West in the final. 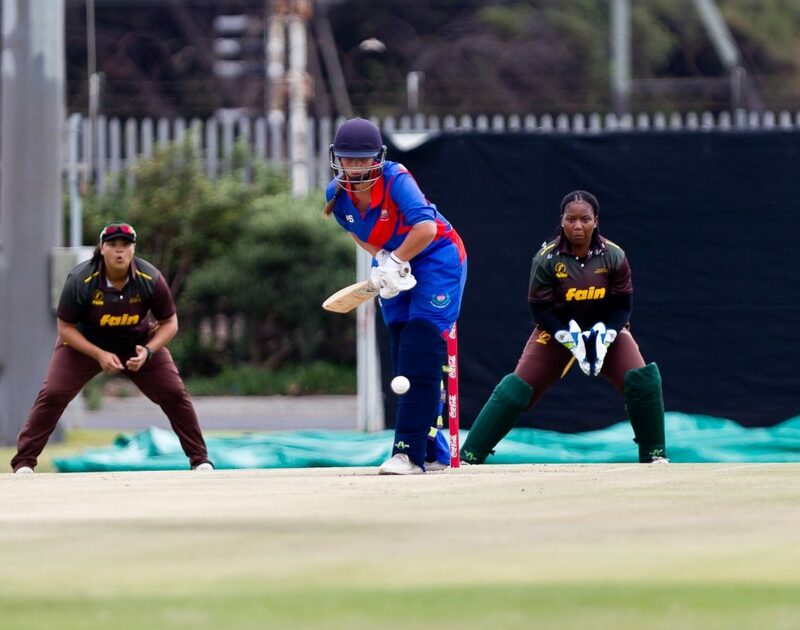 Alida had this to say: “The tournament was a great learning opportunity for me, playing alongside and against Protea players and learning from experienced seniors in my team. Attending National week has been a dream and goal of mine since I started playing cricket seriously and I am more motivated than ever to keep working hard. Girls cricket has grown and developed so much and it has been such an honour to be a part of this.” Congratulations on this excellent achievement. Alida van der Merwe playing in her Western Province kit. Kaitlyn Doms (Grade 9) participated in the Level 3 Artistic Swimming Competition over the past weekend, taking part in the 13-15 Solo Event, 13-15 Duet Event, 13-15 Team Event and Combo Event. She received 3 gold medals and came 2nd in her Solo Routine. Having achieved 1st place in her Duet Event, Kaitlyn and her duet partner have been chosen to represent South Africa at the end of August at the 1st Artistic Swimming Youth Championships in Slovakia. She will also be taking part in the SA Team Event at this championship in Slovakia. Kaitlin on the top step of the podium! 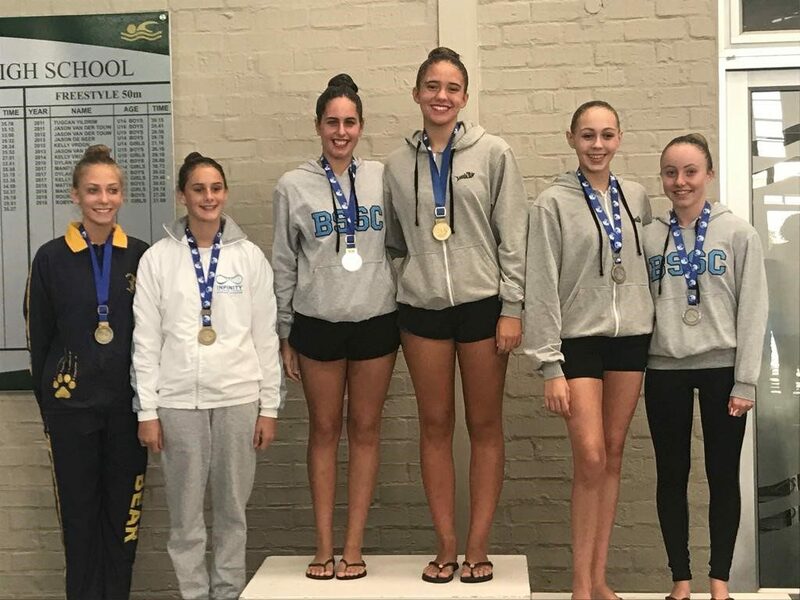 Kaitlyn also received a gold medal for both her figures and solo and a silver medal for her duet in the 13-15 age group at the National Aquatic Championships Artistic Swimming competition in Durban this past weekend. Congratulations on these excellent results and good luck with what lies ahead. Ylara Esau-Salie (Grade 10) participated in the SA National Figure Skating Championships. Her performances earned her a bronze medal in the Novice Ladies section. Congratulations on these excellent results of which we are extremely proud. Danielle van Breda (Grade 11) played in the WP B team at the SA Action Netball Championships from 27-31 March. After 5 days of gruelling action this team won the Gold medals. Congratulations on your fine effort as the Centre of the team! Amber Wilson and Morgan Prins (Grade 12) have both been chosen to represent Western Cape Rowing and will row at the SA National Rowing Champs on 27 and 28 April at Roodeplaat Dam in Pretoria. Congratulations and good luck! 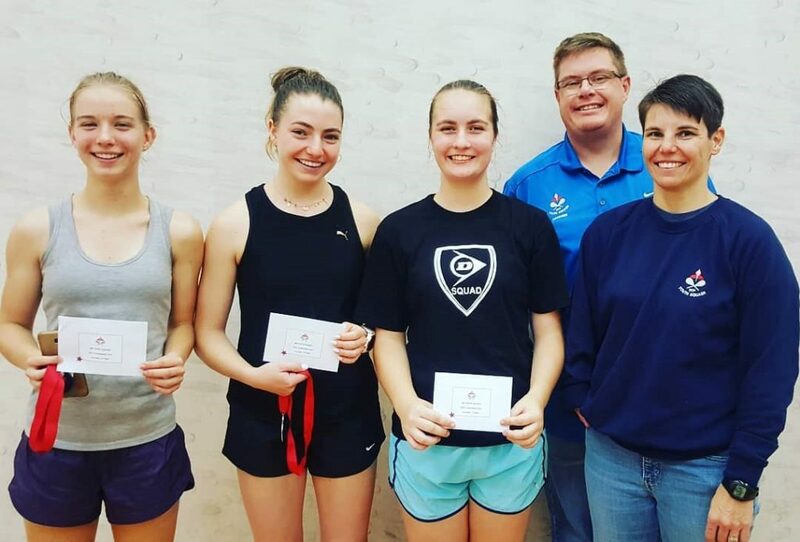 Jordyn Campbell (Gr 11) won the girls U19 section of the Western Province Squash Open 2019 – Jordyn did not drop a game throughout the weekend tournament. Congratulations on this excellent achievement. Daniella Solkow and Erin Hartzenberg (Gr 12) participated at the SA Junior National Swimming Championships in Durban during the holidays. Erin Daffarn (Grade 9), Ashlee Pretorius and Jenna Renecle (Grade 8) competed in the SA Level 3 Regional Age Group Championships in Oudtshoorn. Truly some excellent results. Congratulations, Erin. Ashlee Pretorius (Grade 8) – It was her first time in qualifying for Level 3. Ashlee received a silver medal for the 50m and 100m breaststroke and gold for the 200m breaststroke. Her girls relay team also received a silver medal. She came 5th in 200 IM. A very fine performance all around. Congratulations, Ashlee. Jenna Renecle (Grade 8) – Jenna swam ten races qualifying for eight finals and she managed to swim seven PBs over the 4 days. Jenna’s relay team received a Gold and Bronze, so Jenna is also congratulated on her fabulous results. Juliana Barrish (Grade 9) participated in the Inter-provincial tournament in Pretoria. She played against sixteen teams from all over the country. The U15 Western Cape Disas played very well and in a nail-biting battle for 3rd place lost 22-25 to Gauteng North. Juliana really enjoyed the competition and the team spirit (six girls + six boys) was high. At the National Championships in Bloemfontein, after getting through the qualifying rounds, Juliana played her first match against the eventual winner. All matches were tough and Juliana ended in 30th place in a very strong U16 competition. She placed shared 3rd in the Gold section in the doubles tournament. It was a great experience and definitely motivation for next year! Congratulations. Hannah Hillman (Grade 10) competed at the South Africa Lifesaving Championships in Port Elizabeth, 28 – 30 March. She competed in 14 events in the U17 age group and Junior Ladies. Hannah’s age group had the most competitors and was the toughest. She showed grit and determination and made it through the heats, semis and to all finals. Congratulations on all these excellent results. U19 Hockey Team who travelled to George to participate in the York Easter Hockey Festival from 16-18 March. Match report below. U14 Hockey Team who participated in the Somerset College Tournament from 16-18 March. All results and pictures can be found on Instagram RGHSSport. Going to George for our first York Festival tour was a great experience for this young team. The players worked well with each other and had great fun as a group. It was a perfect pre-season trip to test out different player combinations before our season starts. In a tightly-contested match where both teams had scoring opportunities, RGHS managed to score first from a penalty corner in the third chukka. Bellville came back strongly to equalise in the last few minutes of the match. In a tough encounter, where we expected to have the ball for long periods of time, we struggled to convert on scoring chances. RGHS scored a field goal in the second chukka and then defended for a lot of the second half to maintain the lead and win 1-0. Once again we played so well in the first two chukkas and scored just before half time with a field goal from Josie. Middelburg came back very strongly in the last 10 min and managed to score two goals late in the game. We finished day 2 with a great win against Outeniqua on their home turf! RGHS scored early in the match from a penalty corner (Erin) and again just after half time (Ashleigh) also from a penalty corner. In our last match against the hosts, York, it was always going to be a great contest. In the battle of the midfield, we managed to keep the ball away from their dangerous players and thus stop them from creating goal scoring opportunities.